Nothing unusual here, as many churches in Rome claim to have been built because of dreams or signs from the Divine. But this church is unique in many ways. First of all it's facade looks nothing like a church since it was incorporated into the brick work of the ancient Baths of Diocletian. This church used to be the frigidarium, the cold baths portion of one of ancient Rome's most famous public baths. Then as entrance, you have two huge bronze doors, one of them with a half encased human figure hanging in suspended animation, (shades of Han Solo encased in carbonite)! This door, one of the more recent renovations and works of art incorporated into the church was designed and executed by a Polish artist, Igor Mitoraj, and is suppose to depict the Risen Lord, (note the slashes in the form of a cross). The other door, designed by the same artist is a representation of the Annunciation with the figures of the Angel Gabriel and the Virgin. Another very interesting fact, this church was designed by none other than Michelangelo. After the Sicilian priest had his dream, Pope Pius IV ordered a church be built on this site honoring the virgin, the angels and the christian slaves who perished in the building of these baths. Michelangelo was in the process of designing the church when he died. The church was completed by a pupil of his, Jacopo da Luca, who happened to be the nephew of the priest who had the dream. Talk about six degrees of separation! The first thing that struck me upon entering the church was the massiveness of the structure, the height and breadth of it, this despite the fact that the floor had apparently been raised during one of its restoration phases. The huge cavernous space gives one an idea of the splendor, the magnificence and the importance of the ancient Roman baths. The vestibule was originally the passage hall between the now lost calidarium (hot baths) and the tepidarium (luke-warm baths). One of the more interesting things to see in this church is the meridian line, built inside the church. Because the ancient baths were traditionally built on a southerly orientation, so as to insure unobstructed sun exposure, it was seen as an ideal place, among other reasons, to have a meridian line here. The reigning pope, Clement XI wanted the line built to check the accuracy of the Georgian calendar. The line was constructed by Francesco Branchini, a mathematician, historian and philosopher. When I visited, there was someone there with a ruler and other measuring equipment, studying the meridian line and sundial. On both sides of this meridian line are representations of the Zodiac signs in marble mosaic. Adding to the interesting character and seemingly scientific bent of mind of this church is the Divine Man, a bronze statue of Galileo Galilei found in the courtyard. 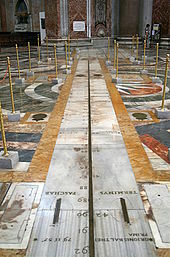 In the Basilica there is also on display, Galileo's Pendulum. Scientific displays are discovered alongside, beautiful, soaring paintings and a modern rendition of St. John the Baptist's martyrdom. We ended our visit by hearing mass celebrated at the main altar. At the same time, a visiting high school choir from the United States was practicing for their concert that night in one of the side chapels, under the painting of the Assumption of Our Lady.